Famous faces throughout the sports world and college basketball used Twitter on Saturday to share messages of encouragement for Louisville's Kevin Ware after he suffered a gruesome broken leg in the first half of the Cardinals' Elite Eight victory over Duke. Some of those athletes have been in Ware's shoes, such as former NFL quarterback Joe Theismann and wide receiver Ed McCaffrey, both of whom suffered broken legs in Monday night football games in their careers. We have a compiled just a small sampling of the touching outpouring of compassion for Ware, who managed to put aside his pain and encourage his teammates and coaches to not lose focus and win the game as he was being taken from the court on a stretcher. 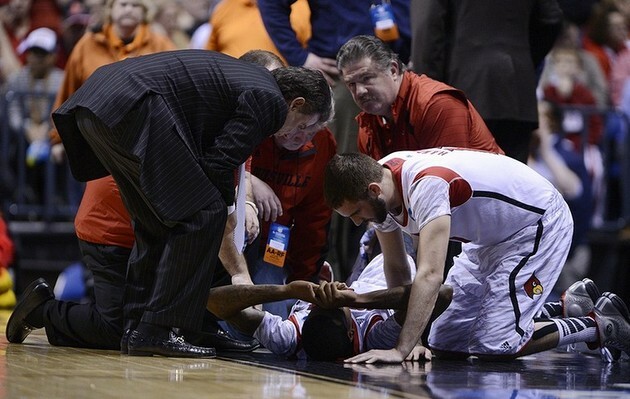 Watching Duke/ Louisville my heart goes out to Kevin Ware. And my thoughts and prayers to Kevin Ware! I didn't even see the injury to Kevin Ware but judging by the tweets my prayers go out to him. Expect it in football but not bball!